This tutorial is quite involved, so gather ye snacks while ye may. First of all, think of what a crumbling building or castle looks like. There are pieces missing from the walls, overgrowth, stones litter the ground, some pieces may be shored up with bracing, there are holes where possibly a cannon ball or battering ram went through. With that in mind, let’s get started. First let’s take apart my castle. Here is the castle wireframe from top. 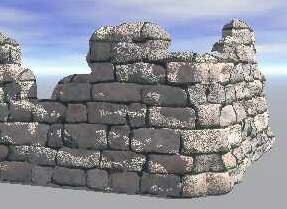 There’s a tower, four main walls, two inner walls, and some stones just layin’ around. 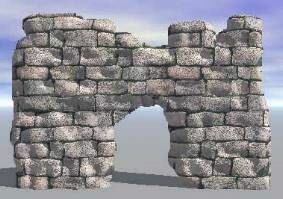 Let’s start with the front wall, the one where the gate used to be. 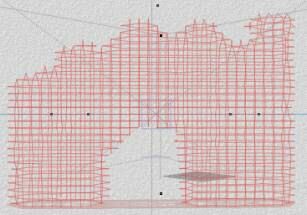 Here is the wall in wireframe view. Notice that it is actually made up of 3 terrains. 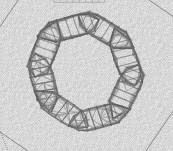 In wireframe view (flipped, sorry about that). In wireframe view (flipped again). Tower, draft & final version. In wireframe view (final version). Turret & main tower in wireframe view from top. 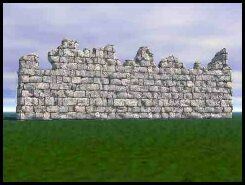 OK, let’s build the front wall & the tower, the rest you can figure out from there. Let’s look at each piece of the front wall. Notice in this view how each piece starts where the one next to left off. This was done without any resizing of individual terrains to match the one next to it. Let’s start with the terrain with the door opening. This is central to the castle and the main entrance. 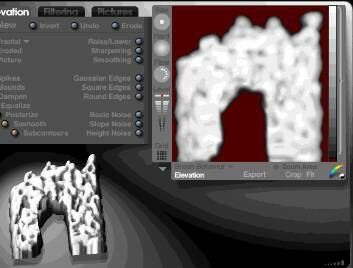 Click on the ‘E’ button next to the lattice to open the Terrain Editor. 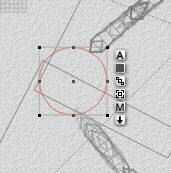 In the Terrain Editor, click on the button next to ‘New’ to delete the current terrain and start a new one. 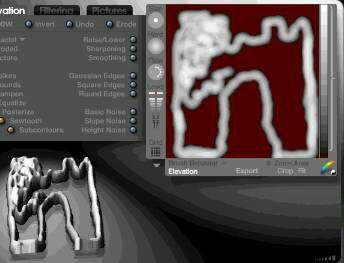 Before we start, have a look at my terrain in the editor. It’s all bumpy but the sides are fairly straight. Make sure your brush size is the smallest possible (leave grid size alone) and that the color level is at the highest level. Start with the door opening and draw a rough wall shape with the top edge having jagged edges. Keep the sides as straight as possible, but stay away from the extreme edge of the canvas. Note: It is extremely helpful to have a pen tablet to do this kind of thing. If you don’t have one, you’ll need to be a bit careful when doing this. Now start to fill in the inside, using squiggly brush movements. 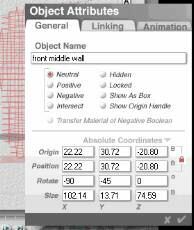 Click on the checkmark to accept the terrain and go back into the wireframe view. 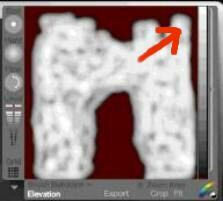 Click on the ‘A’ next to the terrain and rotate it using the numbers shown. Also, give the wall a name so you can find it easily. 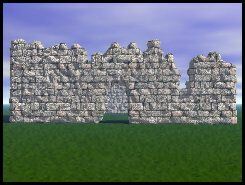 Here is the wall portion quick-rendered (no anti-aliasing). Let’s make the wall portion to the right now. 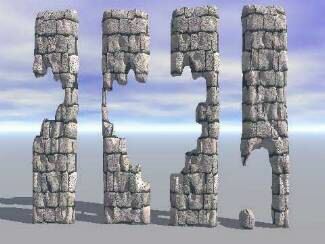 Select the original wall terrain and duplicate it. Move it over until it is next to the original terrain, but slightly overlapping. Rename the new terrain. 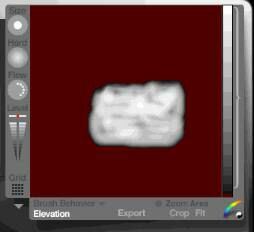 Click on the ‘E’ next to the terrain to enter the Terrain Editor. The new wall will meet the original wall on the right side and the top part of the walls will need to match (see arrow). Lower the terrain until it is almost gone. Decide where the new wall will start and draw in the beginning of it. Now, pull the Level marker all the way to the bottom and erase everything but the white part. 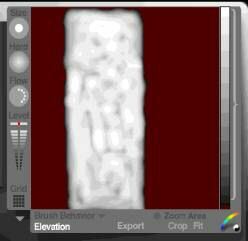 Move the Level marker back to the highest level and draw in the rough edges of the wall. Finish filling it in and return to the wireframe view. 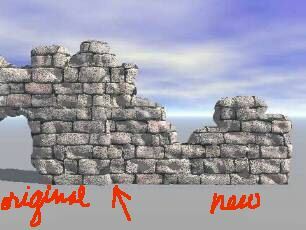 Here we are, but notice that the new wall doesn’t match up with the original one. Use the Rotate Tool in the Edit menu to rotate the new wall until the right side becomes the left side and matches the original wall. Here are the two walls as a quick render so you could see what it looks like. I didn’t align them all the way so you could see where the walls met (see arrow). So you want a corner, do you? Well, select the wall portion next the where the corner will be. 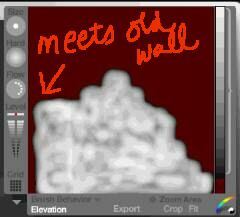 Duplicate it, rotate it and move (use top view) until it makes a corner with the original wall. Leave the side where this wall will meet the other one alone and erase and fill in as needed to create the new wall. Here it is quick-rendered (no anti-aliasing). Now, finish the rest of the walls, naming each piece, grouping sections together, and naming them as well. 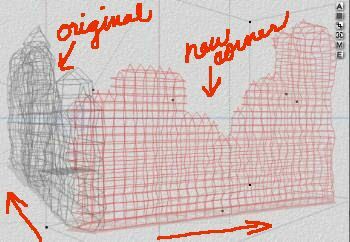 If you don’t want ruins, you can use this method to create complete walls either with the same amount of ‘bumps’ or by working a little more in the terrain editor, smooth them out some. 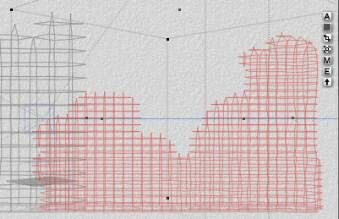 I would not recommend using too much raising and lowering in the terrain editor. 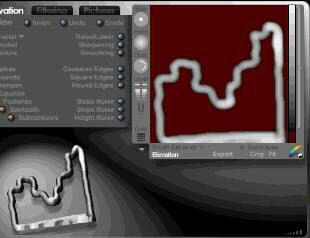 You’ll get better results using the brush and different levels of gray. You can add windows too. 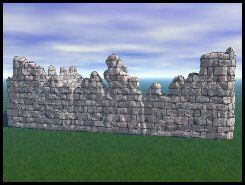 Now that you have an idea of how to build these walls, the tower part of this tutorial is a walkthrough of how I built mine. You can do a plain tower with no damage, but since mine has some, I’ll show you how I did it. Here’s the tower again. Let’s start with the main tower. Here it is in wireframe view, from top. First, I’ll show you one of the pieces in that was built with no damage. And here it is in a quick-render. 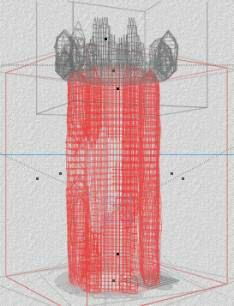 From top view, I added a squashed cylinder and resized it to the size of the tower (to fit in the corner of the two wall sections). 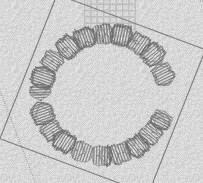 Then I took the wall section from above, duplicated, the moved and rotated each piece until they were in a circle. I kept checking the director and camera views for placement, doing quick-renders as needed. When I was satisfied, I had to decide where I wanted the openings for the door, large hole and a secondary hole. 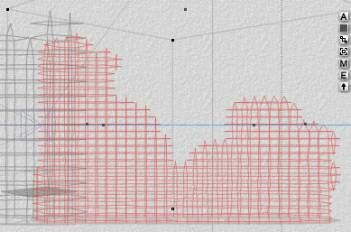 I then opened each piece in the terrain editor and erased and added and checked in wireframe until the holes matched up. Here are the finished terrains used for the secondary hole, main hole (two pieces) and door. 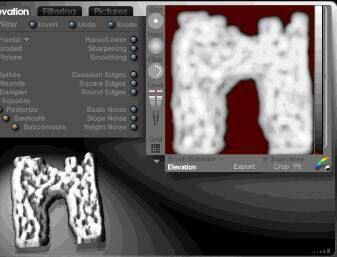 Here they are in the terrain editor. 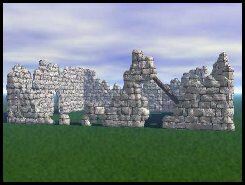 The first and third terrains were rotated in wireframe view. Here they are quick rendered. 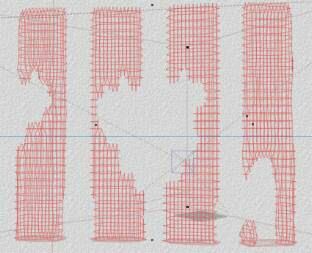 After doing some realigning in wireframe view and adjusting in the terrain editor, I grouped the tower walls and named the group. For the turret, I took the squashed cylinder that I used to build the tower on and increased the size to match about what I wanted the turret to be. Using a symmetrical lattice again, I drew a rough block. Note: This is the same block I used for the ones laying around the castle grounds. 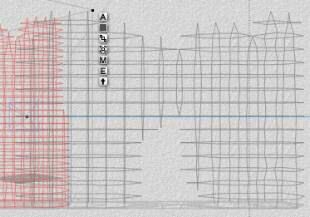 In wireframe view, I duplicated the block, then moved and rotated them until they were all in place. I left a hole where some of them had fallen to the ground. I then selected some of the blocks and erased parts to simulate damage and age, again, trying to match adjoining blocks as much as possible. Here are a few of them. When I was finished, I grouped the blocks, named it, deleted the sqashed cylinder, placed the turret on the tower, then grouped the tower & turret (and named it of course). 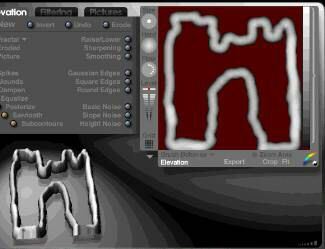 You are now an expert ruins builder using the terrain editor! Please check out my gallery for the ‘Ruins Past & Present’ series images which use my castle ruins. By the way, the wall texture I used is from Chemical Studios.